Christopher Brayshaw is a Vancouver-based critic-curator-photographer-bookseller. He is co- director of CSA Space, an independent Canadian project space. Cedric Caspesyan is the most delightful, prolific and welcome blog visitor, on earth. Carlo Cesta was born in Toronto in 1958. He studied at the Ontario College of Art in Toronto, Canada, completing year of study in Florence Italy, and graduating in 1980. He has exhibited his works extensively since the early '80s. Cesta was a featured artist of Perspective 94 at the Art Gallery of Ontario, Toronto. His exhibitions include: Dallas Underground, Copenhagen, Denmark (1996), Rococo Tattoo (1997) the Power Plant, Toronto (1997), Slowdownspeedfreak (2001)the Winnipeg Art Gallery, Winnipeg, Beyond/In Western New York (2005), Hallways, Buffalo, N.Y., USA, Canadian Club (2005), Canadian Cultural Centre, Paris, France his (2006) installations and interventions at Hart House, Toronto and International House of Sunshine (2007) and Sleep Country (2009) at Diaz Contemporary, Toronto. Lee Goreas was born in Kelowna, British Columbia. He started out his professional career as a painter but he is best known for his drawings, photographs and installations. Lee has been living and working in Toronto for the past eighteen years. During this time he has exhibited in Canada, the USA and Asia. Faye Guenther is a writer and educator living in Toronto. She has written for Broken Pencil and the Danforth Review. She has performed her poetry at reading series in Toronto and Montreal. Her short story, "Bicycle Dreams" was published in Dandelion Magazine in 2009. Faye did the copyedit on this manuscript. David Kramer lives and works in New York City where he was born and raised for the most part. He has visited other parts of the United States but prefers to stay within walking distance of his home where he feels safe in the confines of the Ring of Steel. His work often uses humour to address larger, more pressing issues like trying to balance the existential dilemma and his checking account at the same time. His work has been exhibited throughout North America and Europe. David Kramer is represented by Galerie Laurent Godin (Paris) and Aeroplastics (Brussels). John Massier is the Visual Arts Curator at Hallwalls Contemporary Arts Center in Buffalo, New York. Sally McKay is an independent curator, artist art writer and teacher. She shares a blog with Lorna Mills.Sally was the co-owner/editor of the Toronto art magazine, Lola with Catherine Osborne. Sally has a PhD in Art History and Visual Culture from York University. Jennifer McMackon is a visual artist who received undergraduate degrees from the Ontario College of Art and the University of Toronto and an MFA from the University of Victoria in British Columbia. She has exhibited her work in Canada, the USA, and Europe. 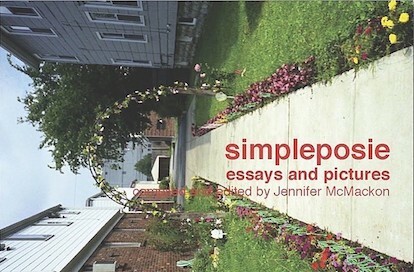 She authored and maintained simpleposie, an online forum for thinking and writing about art. Lorna Mills has actively exhibited her work in both solo and group exhibitions since the early 1990's. A founding member of the Red Head Gallery, and Persona Volare, her practice has included obsessive photography, obsessive painting, obsessive super 8 film, and recently obsessive digital video animations incorporated into restrained installation work as well as online delivery. Mills co-produces an art set with Sally McKay and she has also been a director and Flash game programmer since 1994. Mills recently taught a studio course in web-based Art Practices at the University of Guelph. Megan Morman's practice wrestles with questions of belonging and "recognition by one's peers"; she's particularly interested in the ways that membership in cultural communities are established through storytelling and gossip. Megan's performance and visual work has shown at festivals and galleries including Visualeyez, Artcity (Calgary), AKA Gallery, Neutral Ground and SAVAC. In May 2008 she was awarded the Saskatchewan Foundation for the Arts' Jane Turnbull Evans Endowment Fund for emerging women artists, and her work in the permanent collection of the Saskatchewan Arts Board. Gabrielle Moser is a writer, curator and scholar with a PHD from York University. She has curated exhibitions for Sleepwalker Projects, VTape and Xpace and is a member of the Pleasure Dome. Her writing has appeared in Canadian Art, C Magazine, ease and Invisible Culture: An Electronic Journal for Visual Culture. She co-curated (with Arpi Kovacs) an exhibition on the ole of intimacy in recent photographic and video practice for Gallery TPW, Toronto. Wil Murray was born in 1978 in Calgary and educated at the Alberta College of Art and Design. Exhibiting across Canada, he received an honorable mention in the 2008 RBC painting competition, and was published in the Magenta Foundation's book Carte Blanche, Vol. 2. Murray has lived and worked in Montreal and Berlin. Lisa Neighbor was born in Montreal Quebec, and now lives and works in Toronto, Ontario. She exhibits with Persona Volare and, (a collective of installation and media artists) and is represented by Katharine Mulherin in Toronto. Her exhibitions include Canadian Club (2005) Persona Volare at the Canadian Cultural Centre, Paris, France, his (2006 Installations and Interventions at Hart House, Toronto, Ontario, Welcome All Flies and Fire Alley, Night School, Hart House, Nuit Blanche (2007), Love/Hate (2007) at the Museum of Contemporary Art in Toronto, Erratic Theatre (2008) at the Tree Museum in Muskoka, Ontario, The School of Possibility at Katharine Mulheron Contemporary Art in Toronto, and Two Places at Once, for Nuit Blanche (2009) in Toronto. Andrew J. Paterson is an interdisciplinary artist and writer based in Toronto. Paterson is active with video, film, performance, critical and fiction writing and also music. His videos and films have played locally, nationally and internationally for at least thirty years. His writing has been concentrated with relationships between bodies, technologies and social codes. Jamie Tolagson is an emerging, self-taught artist working in photography.His work as investigated a range of issues, from photography's relationship with the countercultural movements of the 1960's to the subjective experience of modernist architecture in contemporary life. Inherent in his practice is a keen understanding of the vernacular photographic tradition and an ongoing fascination with present manifestations of the past. His work has been shown at CSA Space, Jeffrey Boone Gallery and the Vancouver Film Center, and published in Canadian Art, the Globe and Mail, and Doppelganger Magazine.